KANNAPOLIS, N.C. —Attend a live music venue in the area, and you just might spot an artist in the crowd, busily painting away as he’s inspired by the music. In fact, it’s hard to miss Eric Wattinne. The Kannapolis artist can be seen wearing a suit and tie — with sandals and a captain’s sailor hat. Wattinne strives to be flamboyant. 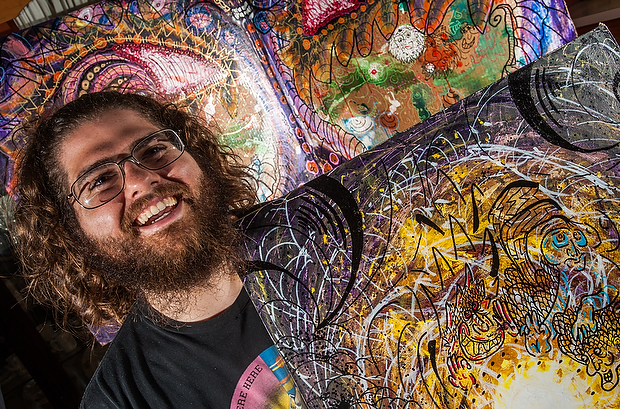 That exploration of consciousness is something Wattinne dives into every time he paints at a music event. He attends concerts and festivals as a guest, performing a “live painting” session in which he creates art while musicians play. “I wanted it be the image of an astronaut who has his face mask break in space and he’s having a death trip,” Wattinne said. After developing the initial idea for the painting, he was able to work with a band to help the concept flourish. Wattinne not only paints to the sounds of live music, but he has also lent his artistic talents to bands, providing their album artwork. He’s worked with Andrew Stamper, as well as the Asian Teacher Factory and The Collectives. The piece he recently did for Andrew Stamper is a burst of purple and yellow, with strange faces erupting from the explosion of color. His work often has strange faces in the background, which are also influenced by Wattinne’s emotions. With music, Wattinne has also been influenced by the work of Ralph Steadman, cartoons, the band the Gorillaz as well as images he’s pulled from his dreams. The different media have influenced a style that he’s spent years developing, dating back to when he was a student at Winecoff Elementary School. Wattinne studied art at UNC Charlotte, and he now works at Dragonfly Studios, where he does carpentry work and fabrication designs. It was at UNC Charlotte, though, that Wattinne first started painting to music. At first he’d just listen to CDs, but by December 2011 he was invited to “perform” with the band The Mantras at the Visulite Theatre in Charlotte. “The energy and the go-for-broke kind of act that they do and just the amount of love they emanate made me just love painting to them,” he said. Now, Wattinne paints to live music on a regular basis. Contact Michael Knox at 704-789-9133.